The collected thoughts and musings of writer Judy Leigh. Food, film, football. Politics, plays and putting pen to paper. Publications, prizes and places to find my writing. ‘The Program’ – blood bags, syringes and sleuth. I watched ‘The Program’, the biopic of Lance Armstrong’s exploits, which deals with his fight against cancer and his decision to take performance enhancing drugs in order to become a Tour de France winner. The film relates the story of Armstrong, from his early days of being a competitive young rider, through his battle with cancer, to his tell-all interview with Oprah Winfrey on live TV. The story is shown from the perspective of journalist David Walsh, on whose book ‘Seven Deadly Sins’ the film is based. Walsh suspected Armstrong’s success was due to his use of banned substances, and ‘The Program’ is largely about his hunt for evidence. We all know the story: at first, cycling has its hero in Armstrong, the champion of seven consecutive Tours de France and the legend of the Livestrong Foundation campaign, supporting people with cancer. Walsh’s accusations ended in a court battle from which Armstrong emerged victorious and ranks closed, until individuals found themselves in a position where they had to tell the truth and Armstrong’s status fell from champion to cheat. The film deals quite openly with the doping in cycling and we understand the younger inexperienced Armstrong’s competitive desire as he reaches an epiphany, having lost a hard race, and he realises he must make a career decision based on pure scientific data: he will not win based on his merits alone, and he is faced with the choice of remaining a noble competitor or having science on his side in the shape of EPO and testosterone or HGH, and becoming a winner. Armstrong embarks on a programme of drugs and a powerful propulsion to seven titles and world-wide admiration. 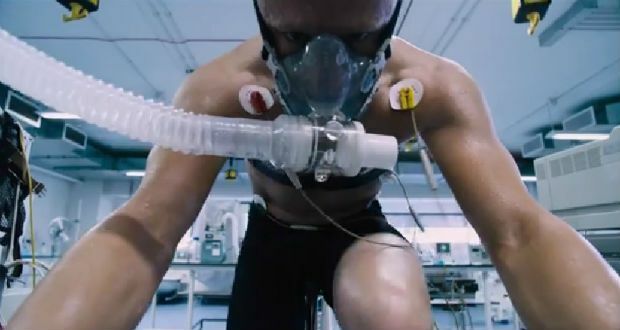 If you are looking for a film which tells the viewer how to feel about Armstrong, showing his background and character in depth, then this film will not be satisfying. We see hardly anything of his courtship, his wife, his family. His relationship with Sheryl Crow is not mentioned. When we see him at home, he is alone, with only his framed yellow jerseys for company. This highlights the solitude of his performance as a cyclist, his blinkered dedication and how he was teetering on the brink of detection, avoiding it craftily for so long. We see Armstrong’s bravery and his humanity as he sinks into a wheelchair after cancer treatment and there is a tender moment when, much later, he visits Jack, a cancer sufferer, and offers him his time: we know Armstrong understands the boy’s situation exactly. Armstrong is nothing more than a talented athlete consumed with hunger to be the best. It is clear from this film why substances were used widely by cyclists: it was the only way to win; victory is a cyclist’s raison d’être, and the film portrays this perfectly.The film is, if anything, about cyclists’ mentality: their dedication, their desire and their blind single-mindedness, without which they would not ever be a valid competitor. This isn’t a romantic film or a moving film: it is, at times, more of a documentary and it hits hard. Much of the footage is genuine and there is a priceless and moving moment where we hear Phil Liggett commentating on the Tour de France television programme, praising Armstrong with superlatives and refuting the existence of doping in the sport. This is a film for people who know and love cycling. They will admire Foster’s performance and Armstrong’s situation will strike a chord, however they feel about banned substances. It is a film for people who know nothing about cycling, but who are intrigued by the doping scandal, how it unfolded and how Armstrong rose to the heights of hero then descended to the depths of villainy, and what desire, instincts and convictions compelled him, what chances and risks he took, and what sacrifices he made. Those who are interested in a journalist’s battle to tell the truth against the background of media adulation will find the film captivating in its realism. For those who want a rounded story, well told, with a nicely finished ending, this may not be the film for you, but ‘The Program’ carries with it some good performances and some interesting thoughts about competition and the desire to be the best, the cost and the pain, and the inevitable Paradise Lost. Punch and Judy politics? Send them to the naughty step! On International Women’s Day – it’s about being worth it.